October 15, 2017 marked the exact date of 200th anniversary of the death of Tadeusz Kościuszko (1746-1817). Considered by some historians as the world’s most popular Pole ever, he is widely remembered as heroic fighter for Polish and American independence and champion of democracy, equality and human rights (see our downloadable brochure to the right). 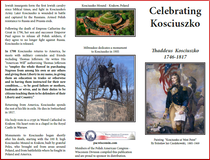 Kościuszko bicentennial has been celebrated around the world with commemorative ceremonies, exhibits, performances and competitions. Some bicentenary-related events took place also in Milwaukee. The largest one was certainly “ A Day With General Kościuszko” gathering around his recently renovated monument in the Kościuszko Park. There were also several opportunities to learn more about Kościuszko’s life from lectures hosted in the Polish Center and during the 2017 Polish Fest. Some members of the PAC-WI Division attended also a spirited and very informative lecture “WHO WAS THADDEUS KOSCIUSZKO AND WHY SHOULD WE REMEMBER HIM – TWO CENTURIES AFTER HIS DEATH” (podcast to the left). Given in Madison on September 14, 2017, by the PAC member and professor emeritus of UW-Milwaukee, Donald Pienkos, the lecture – was sponsored by the Polish Heritage Club of Madison-Wisconsin and organized by the Center for Russia, East Europe, and Central Asia (CREECA) at UW-Madison. 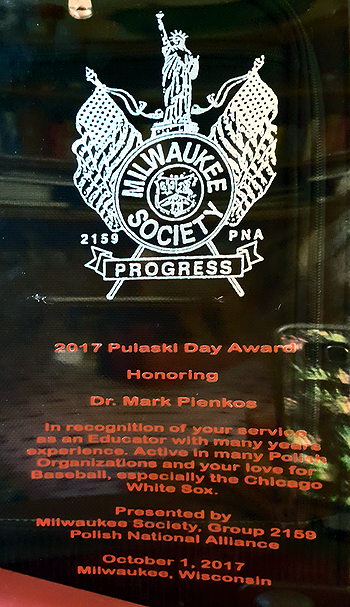 The first day of Polish Heritage Month brought great news to Polish American Congress – Wisconsin Division of (PAC-WI) with Milwaukee Society of the Polish National Alliance naming this year Dr. Mark Pienkos as Polish American of the Year. 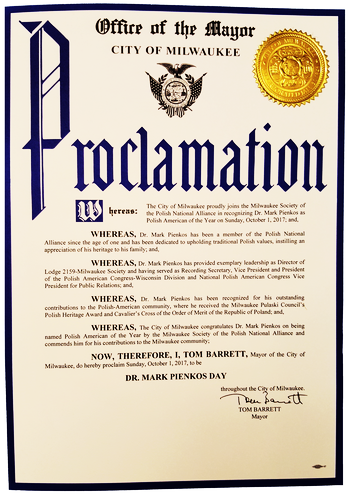 In conjunction with this recognition, the Milwaukee City Council presented him with congratulatory resolution and Milwaukee’s Mayor,Tom Barrett, proclaimed October 1, 2017 to be Dr. Mark Pienkos Day. The award ceremony took place during the Annual Pulaski Day Banquet commemorating the death of General Casimir Pulaski (Generał Kazimierz Pułaski) and the 1929 resolution of U.S. Congress designating October 11th as General Pulaski Memorial Day. 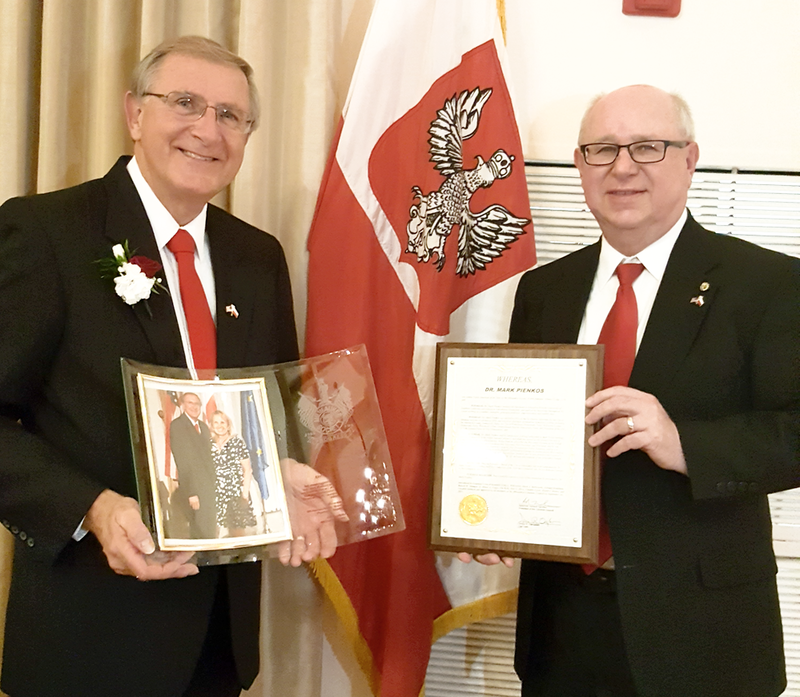 The title of Polish American of the Year is traditionally awarded to Americans of Polish descent for their outstanding community service and Mark’s contributions to various communities fit the bill perfectly. Known as “Dr.P.” to his students and coworkers, he devoted the entire forty four years of his career in education to helping “kids of all ages” succeed. From teacher, counselor and principal at elementary and high school level, to superintendent for the Washington-Caldwell School District and Traver School in Lake Geneva, he also taught courses for teachers in Aurora University and Lake-Sumter Community College. Given his penchant for politics, Mark also held several elective positions in communities of his residence and various democratic parties (see the biography on his website). But most notably for Polish American interests, Mark is also an active member of the Polish American Congress (PAC). After presiding over Wisconsin Division of this organization for several years, he now serves as its Vice President, as well as a representative to the National Council of PAC Directors and the PAC National Vice President for Public Relations. He and his family have been also the long time members of Polish National Alliance (PNA). Mark is also known for his love of sports that came to fruition in the book “1917-2017: One Hundred Years of White Sox Baseball” published in 2017 (see our earlier post and news on his website). The team was a great positive influence in his early years in Chicago’s South Side. Now Mark uses the book to “pay it forward” with some of the proceeds going to Stella and Edward Pienkos Educational Fund providing scholarships to graduating high school students. The fund was established in memory of Mark’s parents. The hardships of immigrants’ life robbed them of a chance to get high school diplomas, but they both worked hard to get solid education for Mark and his two brothers (Donald Pienkos – now professor emeritus at University of Wisconsin-Milwaukee and Edward Pienkos – a surgeon). And now Mark helps others to achieve the very same goals. What a long, winding road it has been since Mark’s grandfather Walenty Pienkos arrived to New York City on September 16, 1912 from a small village near Rzeszów – then in Austrian partition of Poland (see the video to the right).